Also serving communities of Mission. There are 40 Assisted Living Facilities in the Prairie Village area, with 2 in Prairie Village and 38 nearby. The average cost of assisted living in Prairie Village is $3,592 per month. This is higher than the national median of $3,346. Cheaper nearby regions include Leawood with an average starting cost of $3,528. To help you with your search, browse the 244 reviews below for assisted living facilities in Prairie Village. On average, consumers rate assisted living in Prairie Village 4.5 out of 5 stars. Better rated regions include Grain Valley with an average rating of 5.0 out of 5 stars. Caring.com has helped thousands of families find high-quality senior care. To speak with one of our Family Advisors about assisted living options and costs in Prairie Village, call (855) 863-8283. Located south of Kansas City, Prairie Village has been named one of the 50 best suburbs in America by Business Insider. This small city is home to just over 22,000 people, nearly 20 percent senior citizens. 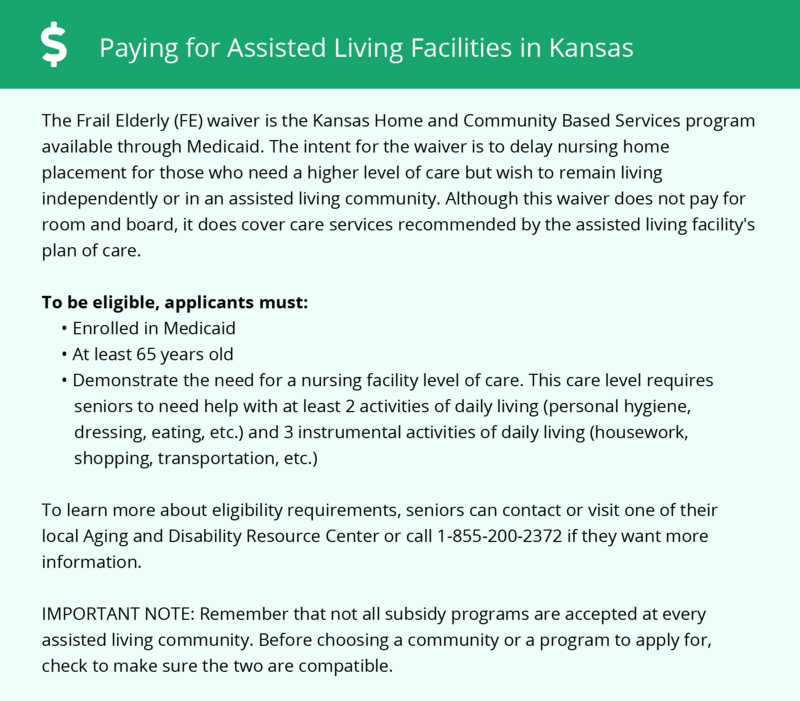 The Kansas Department for Aging and Disability Services licenses assisted living facilities as adult care homes. Licensed facilities provide personal care and supervised nursing care to six or more seniors. There are two assisted living communities in Prairie Village with another 38 located in nearby communities. Prairie Village is known for its annual jazz festival, JazzFest, which may interest seniors. Seniors can also take advantage of the many cultural attractions in the Kansas City Metropolitan area. Many of these attractions, such as the Kansas City Zoo and the National WWI Museum, offer discounted tickets for seniors. Seniors can use the Ride KC bus service to travel throughout the Kansas City area. Half-price fares are available to seniors who have completed an application. Eligible seniors can schedule rides on the county’s curb-to-curb bus service, RideKC Freedom. Summers in Prairie Village are hot, with highs in the 90s. While winters are cold, the city receives half as much snow as the U.S. average at just 13 inches per year. Seniors who enjoy winter sports may prefer to retire in a snowier part of the country. Retirees in Prairie Village may not be pleased with the state’s tax policies. The state’s sales tax is the eighth-highest in the country. Out-of-state pensions, individual retirement accounts and 401(k) plans are fully taxed, so seniors may have less room in their budgets for assisted living costs. Prairie Village has a high crime rate compared to the rest of Kansas. Its crime rate is higher than 81 percent of communities in the state. While the risk of becoming a victim of violent crime is low, residents have a one in 41 chance of being a victim of a property crime. The Kansas City metropolitan area has poor air quality. It ranks among the 50 most polluted cities in the U.S. for two air quality categories: 24-hour particle pollution and annual particle pollution. Seniors with respiratory conditions may want to talk to their doctor about the effects of air pollution on their health. Assisted Living costs in Prairie Village start around $3,592 per month on average, while the nationwide average cost of assisted living is $4,000 per month, according to the latest figures from Genworth’s Cost of Care Survey. It’s important to note that assisted living rates in Prairie Village and the surrounding suburbs can vary widely based on factors such as location, the level of care needed, apartment size and the types of amenities offered at each community. 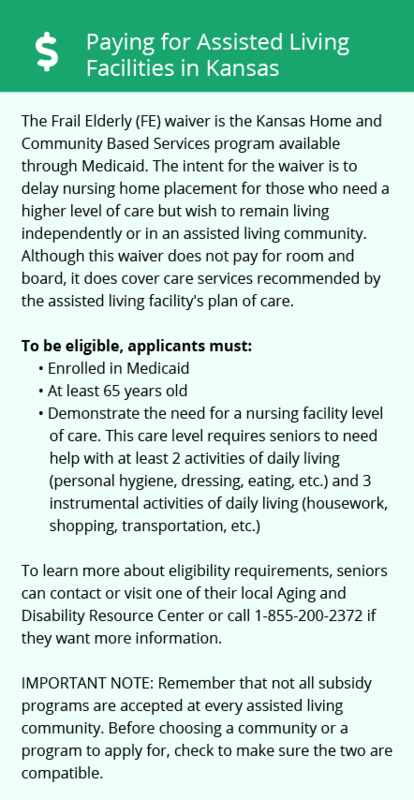 Prairie Village low-income seniors can apply for a Medicaid waiver called the Frail Elderly waiver that may cover personal care services while in assisted living. Prairie Village and the surrounding area are home to numerous government agencies and non-profit organizations offering help for seniors searching for or currently residing in an assisted living community. These organizations can also provide assistance in a number of other eldercare services such as geriatric care management, elder law advice, estate planning, finding home care and health and wellness programs. To see a list of free assisted living resources in Prairie Village, please visit our Assisted Living in Kansas page. Prairie Village-area assisted living communities must adhere to the comprehensive set of state laws and regulations that all assisted living communities in Kansas are required to follow. Visit our Assisted Living in Kansas page for more information about these laws.